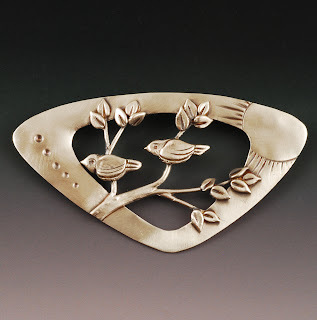 The second treetop brooch came out the kiln with some minor issues of its own. First, there were a couple of branches that had breaks, one at a seam and one behind a bird where it didn't show. In both cases, I added more clay and refired, which worked fine. You'll notice I haven't inserted the stainless steel pin stem yet. After the first Treetop brooch, I realized that the the pin stem shows through the open center of the brooch, so I decided I should do the photos before I install it. Other issues that arose are hidden on the back. 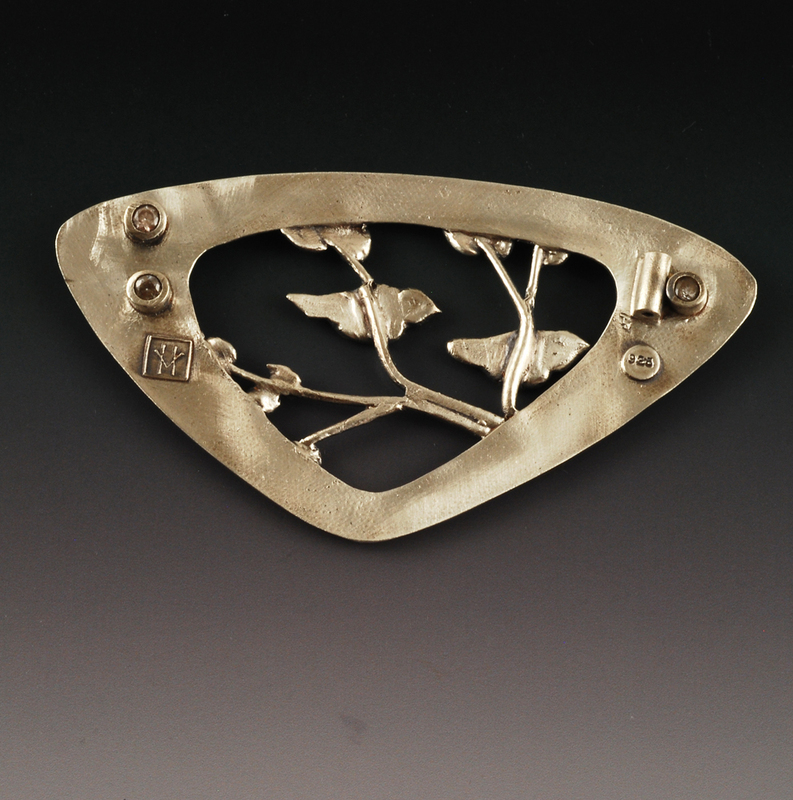 This brooch was my first use of tube set CZs for the brooch mechanism. I used the extruder to form a tube of clay, then opened the center of the tube with a stone setting bur to hold the stones properly. I filled the lower space in the tube to make it solid and more sturdy, but then cut slots in the clasp posts for holding the pin stem closed. Since I didn't think to support the cut tubes somehow, both sagged due to gravity during the firing and subsequently the slots had to be filed out and the tops aren't level. Also, either I didn't get the stones transported to the kiln straight (I was very careful when I first installed them) or they moved during the firing and aren't seated in the tube settings nicely. These are overall minor issues, but I am trying to get better at controlling all the little details so that I can present the very best work possible. So all these mistakes are opportunities to master my technique and develop solutions to these issues. Vickie, the brooch is lovely! I just created a tube setting for a CZ in a fine silver piece recently. I will be blogging about it soon as I just received the photos from the photographer. The stone shifted during firing just like you experienced. I am certain it went into the kiln straight and tidy but it is slightly off from straight now. I can think of no recovery at this point. I also noticed on some stones that I press set into clay that after I patinated the surface near them there is a haze under them that did not come clean with distilled water. I can't use ammonia I think or I will change the patina. Do you have any suggestions? Interesting, Joan! I, too, thought I was very careful when I placed the stones. It seems like the clay is moving asymmetrically. In my case that is easy to understand, since I cut clay out from under one half of the stone. How about your situation -- any asymmetry? By haze do you mean that the patina reached under the stone? In that case I can imagine no way to remove it without affecting the rest of the patina. Did you dip? You might have better luck applying the patina with a brush. I'll look forward to your report of your experiences. I used a brush to apply the patina onto the area around the stones but some solution could have leeched under the stones. I need to spend some time with a new software package to resize these monster photos and I will post some soon. The ring setting is not to my mind asymmetrical but let me describe what I did. I made two metal clay tubes of different diameter. I fitted the small one on to the ring, had to curve the under side slightly to fit onto the curved ring. Then I fitted the outer tube onto the ring in the same fashion. I tapered the upper portion of the outer tube so that I could form it like you would a bezel after firing to make it look neat over the stone. The ring is textured but it is a shallow texture. I did apply tiny bits of slip and did some water washing so that the outer tube fits without any noticeable seam onto the textured surface. I am going to get that picture posted today and I will make sure you see the link. Before firing the stone sat neatly on the inner tube with space all around it where the outer tube could shrink. It looked very even. I used some support to prop the ring into the cold kiln. I checked the level of the stone at that point and it looked straight. It is a slight thing but it is not perfect now which gets under my skin of course. Sorry, Joan and Sue! I went out of the country for Spring Break and had rather limited internet access. How spoiled we all become! Sue, that's a fabulous idea about the water to set the stone. Thanks for sharing that. I have set stones in fine silver clay this way with no trouble, so I'm thinking there's something different going on with the sterling clay. Of course, it's always possible that I just had a bad setting (2 out of 3, actually) for the first time. I will have to do more to figure out if it's me or the clay.